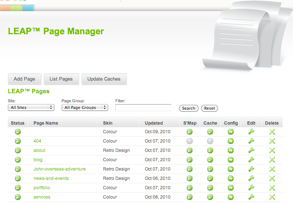 On the page list you can see pages that are already set up, and from here you can manage whether the page is set to Live, or is hidden (not Live). a specific Style Group - where this defines the fonts and colours that are common to all pages in that group. Page Forwarding for temporary of permanent redirection of existing/historic URLs to a new instance. TIP! use deletion with care - you can always make a page inactive or hidden until you are sure it is not needed anymore.